Thanks for the WalMart 'heads up.' ... One thing - looking on Amazon, I saw that the higher grit papers were not aluminum oxide (as Dave said he uses). Is that a big deal? It's really simple, here it is. It works well on the rear of the trigger bar that contacts the sear trigger pad and the FPB lifter pad. The top pic is how it looks ready to use, the bottom is how it looks when purchased new. Does anyone know what number bit this is? I've looked on dremel's site at all the pictures and don't see one like this? Not a bit, it’s a mandrel for mounting cut-off discs. FYI... 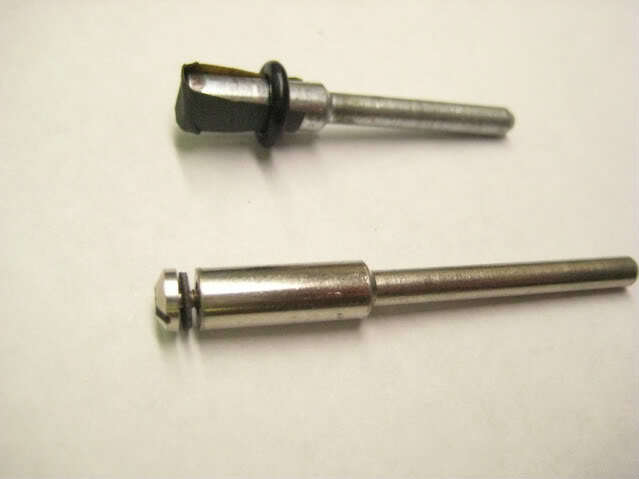 The part is the: 402 Rotary Tool Mandrel. The official Dremel one is expensive (~$10). There 10-12 piece knock off sets on Amazon for less than $10. For this application, they should work fine. Sorry if someone has asked this before and I missed it, am I right in thinking the polishing stuff is either the red or white polishing bar stuff I see in the hardware store? I've heard the white stuff mentioned before as the thing to use on steel, I just want to make sure. I'm about to pick up a punch set so I can finally get my surplus 85 apart and give it a thorough cleaning, I might as well pick up some polishing tools. I've already got up to 1200 grit sandpaper so I'm set there. Second question: I can't find any tiny buffing wheels, do you buff the whole thing in one go or should I use a q-tip or something in my variable-speed electric screwdriver with the polishing compound for the smaller parts?